Our new 2016 Model V-Series with Major Upgrades released. Please Visit New Dedicated Website www.Vinyl-Cutter.co.za for More information. This page no longer updating. Please visit www.Vinyl-Cutter.co.za for more up-to-date information. A vinyl cutter is essential for every signage business. 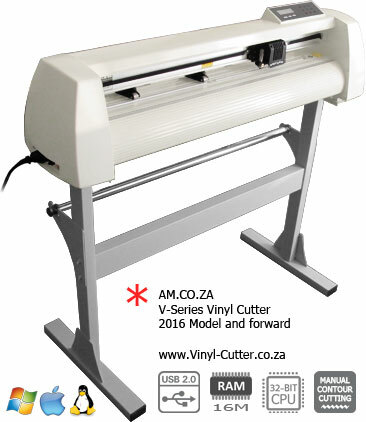 http://am.co.za/ Our vinyl cutter is quality built for continuous vinyl cutting. With the extremely affordable price, even hobbyists use our vinyl cutter to cut car window decorations and art pieces. http://am.co.za/ Our vinyl cutters are computer controlled and very easy to use. Fast cut, easy to use, works like a Printer (Install Vinyl Cutter as a Printer). All our vinyl cutters are Windows XP and Windows 7 compatible (32bit and 64bit). With our vinyl cutter, all vector designed file formats from CorelDRAW, AutoCAD and Adobe Illustrator can be cut. For Windows 8, we suggest you purchase V-Smart Series Vinyl Cutters or use Flexi Software. If you are running a signage & shopfitting business, we recommend V-Smart for fastest turnaround time, best precision and best thick material handling. The vinyl cutter is fast moving CNC machine for cutting vinyl with a rotatable blade ( drag-cut ) , http://am.co.za/ peel the cut-outs off to get the finished cutting piece. The vinyl cutter is an entry level machine for every signage business. It's essential for sign making. http://am.co.za/ Computer designed vector files with patterns and letters are directly cut on the roll of vinyl which you have mounted and feed into the vinyl cutter, through USB or serial cable. Generally vinyl has 5 years lifespan before crack and colour starts to fade, http://am.co.za/ which makes it perfect for making signage and create window decorations. Special vinyl can also create glass sandblasting effects and make patterns for T-shirts. All sized vinyl cutters look the same except for the width that vary. http://am.co.za/ With slidable pinch roller, any vinyl paper size that does not exceed the max width can be used. You can also read the Vinyl Cutter Operation Manual online http://am.co.za/. Due to the fact that it is such an easy-to-read manual, http://am.co.za/ the instructions are simple to follow and you will be proficient in the usage of the cutter in just a few hours. Three super steel vinyl cutting blades are included, http://am.co.za/ with Knifepoint Offset 0.25-1.0mm (450-1500). The length of time that a blade lasts will depend on a variety of factors including how much cutting you are doing and what you are cutting. http://am.co.za/ For example, reflective materials have glass beads in them and wear down blades much faster than heat transfer materials do, for example. http://am.co.za/ The rule of thumb is to perform and evaluate test cuts at regular intervals. http://am.co.za/ If you are working with a material that isn't cutting the way it used to, check your blade first. Our blade holder is quality built with aluminium which can last for the lifetime of the vinyl cutter. http://am.co.za/ It holds the cutting blade and is installed onto cutting head. Our V-Series Vinyl Cutter Blade Holder is compatible with Roland Vinyl Cutters. Cutting plotter is a type of plotter that cuts by moving a blade across the vinyl surface. Our vinyl cutter can also work as traditional pen plotters, which print by moving across the surface of a piece or a roll of paper. http://am.co.za/ Just like cutting the line on vinyl, the plotter is restricted to line art, rather than raster graphics as with other printers. Standard ballpoint pen refill is used for the holder. Our vinyl cutting plotters are very affordable, suitable for signage makers, home businesses and hobbyist. http://am.co.za/ The vinyl cutter is very small and advanced CNC machinery, you can come to pick it up or ask us to organize shipping for you on your own account. http://am.co.za/ All our prices exclude VAT but you do not need to pay VAT if you do not wish to. You can come to our workshop to see a vinyl cutter demonstration and can also attend training courses on vinyl cutting machine and usage training on software. http://am.co.za/ We provide a one year quality warrantee for all vinyl cutters for your peace of mind. This is a Complete Package for your vinyl cutting requirements. http://am.co.za/ With the Artcut Software included, not only can you design your artwork, but you can also ensure that the cutting process has more refined control. Artcut software's latest version was developed in 2008. It is therefore not completely compatible with newer versions of Windows or with the more recent range of vinyl cutters. It is for this reason that we will no longer be providing full support for Artcut software as of the beginning of September 2014. Should you specifically wish to purchase the Artcut software, you are welcome to purchase it from us. While we are still offering the product, we are just not able to provide sufficient support for the product, you will need to use Artcut Support Forum for support instead. If you have CorelDRAW, Adobe Illustrator, http://am.co.za/ AutoCAD or other vector design software, you do not need specialized software. We have a free printer driver where you can directly cut from your design software. FlexiSIGN (a.k.a Flexi) is a powerful sign making software. We include it as standard software for V-Smart series vinyl cutters. You Save R500 by purchase this package specially selected for Signage Business. All our machines include vinyl cutters are traceable online by our barcode system. Machine info, year model, purchase date, warranty details and service history are available to check online. http://am.co.za/ We identify our machines through barcodes only, not the invoice or the person who bring it in. If you find a lower price from our local competitors, our lowest-price guarantee is here to insure you get a quality vinyl cutter at lowest possible price. V-Series vinyl cutter boasts our own brand. Just like our other machinery, http://am.co.za/ they are all imported directly from our manufacturing factory in China and assembled at our warehouse in Johannesburg. With a full range of spare parts and factory trained technicians always available, http://am.co.za/ we are not only able to provide such low-low prices but also give you a one year quality warranty and life-time repair and service. Which Kind of Vinyl Can the Vinyl Cutter Cut? This is normal a vinyl roll to make signs, waterproof and weatherproof. http://am.co.za/ Normally it has a 1 year, 3 year or 5 year rating indicating when the colour will start to fade under harsh conditions. This type of self-adhesive vinyl, http://am.co.za/ offers much greater visibility than regular vinyl because of their bright colours. Reflective vinyl offers great visibility at night, http://am.co.za/ just like you see on the strips on police vehicles. Almost every single 10111 car and ambulance in South Africa has reflective vinyl strips on it. Create sandblasting effects on glass without etching. http://am.co.za/ From banks to offices, every sandblast glass you see out there is done by sandblasting vinyl. Save cost on etching and also easy to redo and reuse. Also called Heat Press Vinyl. http://am.co.za/ Most customers use it to put patterns, numbers and names on clothing like sports uniforms or corporate wear. http://am.co.za/ Use a heat presser or simply an electric iron to apply the heat transfer vinyl permanent onto the cloth. Learn more about the vinyl cutter in details by reading the operation manual.